The hardest thing about learning to read the phase graph on an audio analyzer like Smaart is finding a PA to practice with. In the world of my dreams I would have a giant warehouse with every speaker model on earth and endless time to practice tuning different configurations. In the field, we have the opposite. We have one or two speaker models to work with and little to no time to complete our tuning. So how can we practice learning to read phase traces when we don’t have the time and resources? MAPP XT, even with all of its problems and limitations, is still the best sandbox to play in for sound system engineers. Sure, it only offers Meyer Sound speakers and 2D drawing and predictions, but those predictions have highly precise 1/24th octave frequency resolution and you can place a measurement microphone anywhere in the sound field to investigate the amplitude and phase response. What does that mean? 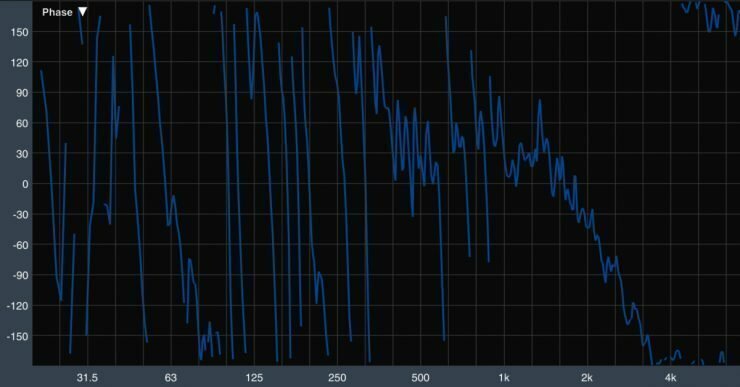 You can use MAPP XT to practice reading phase traces, even when you don’t have a real PA.
Of course, measuring real speakers in the wild is always preferable, but unless you are on tour or working shows every day, you may not have access to them. Wait for an email from Meyer Sound with a login name and password. Open MAPP XT and log in under the Settings menu. At the bottom of the Sound Field window it should say Server Login Status: Online Mode. If you have any trouble, contact tech support. Right-click anywhere in the sound field and insert a full-range loudspeaker from the popup window. Tip: Do not switch away from MAPP XT while choosing a speaker. For me, this causes it to crash. Right-click anywhere in the sound field and insert a microphone. Open the Measurement Viewer under the Tools menu. Switch to the frequency response tab and the results view. You should see an amplitude measurement on the top and phase on the bottom, just like an audio analyzer. In fact, the Measurement Viewer used to be called Virtual SIM in previous versions. WARNING: Keep calm and resist the urge to send me an angry email that says, “What do all of the squiggly lines mean? !” You are looking at a lot of information at once and it is mostly useless unless you have a question to answer and/or something else to compare it to. Let’s start by making the graph a little easier to look at. Press Auto-Set Delay. Now press the up and down buttons on the delay field. Without worrying about what the specific number is, just observe what happens to the phase trace. I’m going to save any comments about what you are looking at for another article. For now, practice moving your speaker and microphone around the sound field and observing the changes in phase. For easier comparison, save traces by clicking Store and then recalling them into one of the four available memory groups. What trends can you notice about the orientation of the speaker relative to the microphone and the result in the phase graph? Once you’ve identified a trend, can you predict it accurately? Next, try enabling a single wall under Settings > Prediction Plane. What happens to the phase measurement as the path lengths change between the direct signal and reflection? How are they connected to the amplitude graph? As you can see, it is easy to make the design more and more complex. You might want to turn off the walls and insert a subwoofer so that you can practice a main+sub phase alignment. Notice that you can solo a speaker by clicking on it in the Sound Field before you press predict in the Measurement Viewer. After you practice reading phase traces in MAPP XT for a couple of hours, you may wonder how this will transfer to your audio analyzer. File > Export Measurement Data. Save. Open the spreadsheet. Save as CSV. In Smaart, open the transfer function module. File > Import > Import ASCII (FFT: MTW, Sample Rate: 48000, Interpolation Type: B-Spline). Import. Right-click the trace name in the Data Bar. Click Info. Set dB offset to -85. Ok. Drag the magnitude trace to adjust the offset. For French users we have a conversion problem between.XLS and.CVS (export measurement data and conversion for smaart). Most French software (I tested free office and excel) does not respect the CSV UTF-8 standard. -The decimal separator is one, instead of one. I made a small PDF explaining how to solve this problem for LibreOffice and Excel. Download here. Have you discovered any other good ways to practice reading phase traces when you don’t have a PA? Let me know in the comments below.